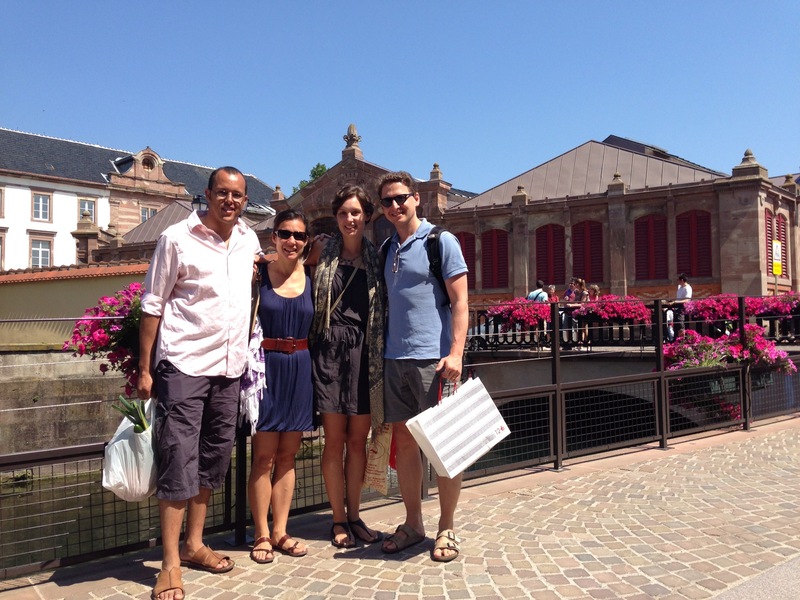 What a whirlwind it has been since we returned from our trip to Europe. 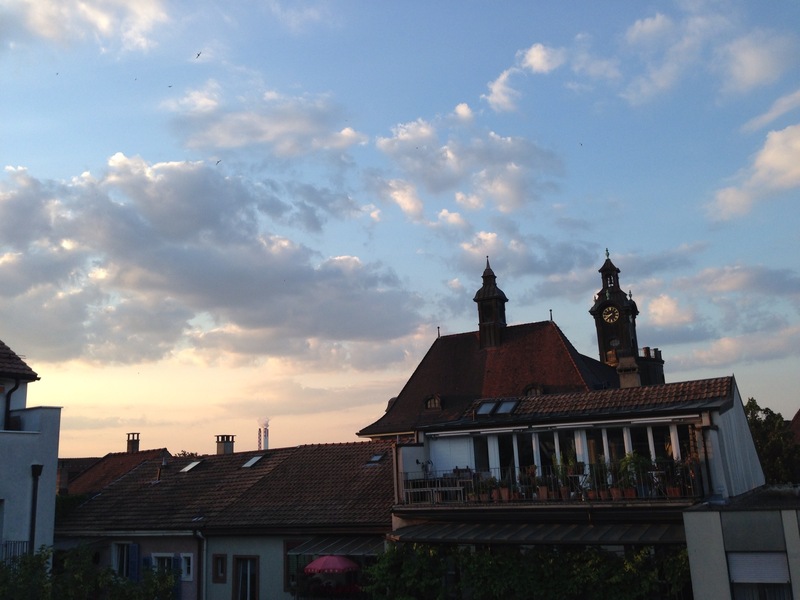 We had a great time in Basel, Colmar, and Stockholm. But thing thing Garriy and I both took back home with us, as usual, is that it is the people that make the place. 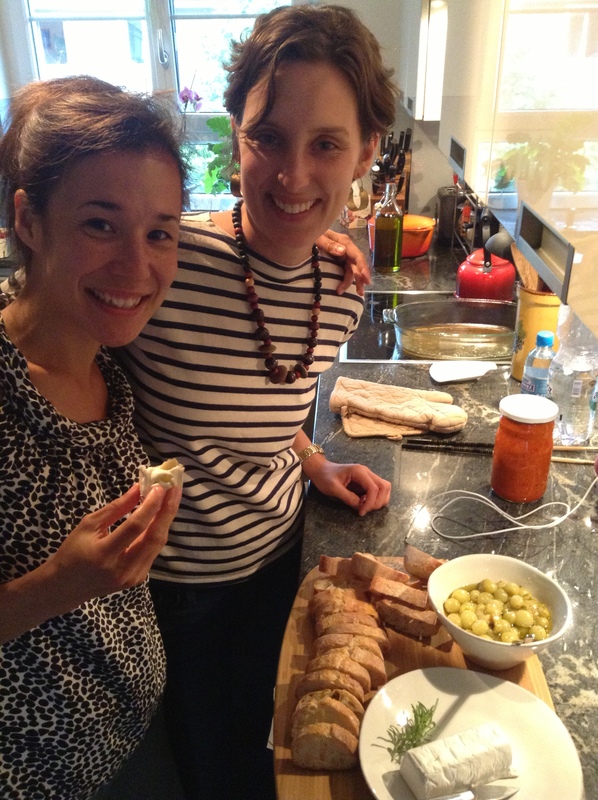 Our favorite part of the trip was being with Aya and Kileken in their lovely home in Basel, cooking dinners with them, drinking too much wine together, and getting lost while biking through vineyards with them in the Alsace in France (more on that in the next post!). As you know, Aya and I met studying together in Morocco–and one of the reasons we hit it off so well is because I think we travel and approach the world in a similar way. Our most recent trip only underlined that. Aya spoiled us with lots of meals that we should try and post (including moules in wine sauce, which entailed lots of YouTube videos about how to debeard mussels), but we all cooked some amazing meals together as well. 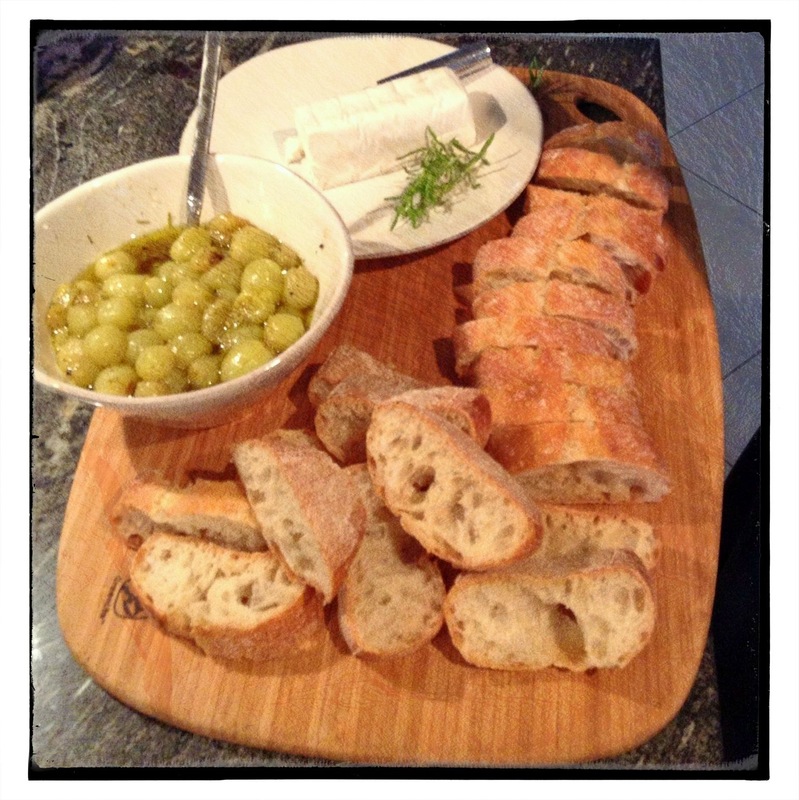 This is a simple appetizer I made during our visit that I love and I learned from my friend Trish. It’s so easy to put together, which makes it all the better. If you decide you don’t want it as an app, the grapes on their own are also great as a side (especially roasted pork, or a polenta and veggie main). Miss you A&K! Preheat oven to 425 degrees Fahrenheit. Combine the grapes, olive oil, rosemary, and pepper and toss to coat. Put the grapes on a baking sheet or in a baking pan and place in oven. Roast for 20-30 minute or until grapes begin to burst and put out their juices. When done, sprinkle on a generous amount of coarse sea salt to provide a nice crunch. Serve with the goat cheese and baguette. 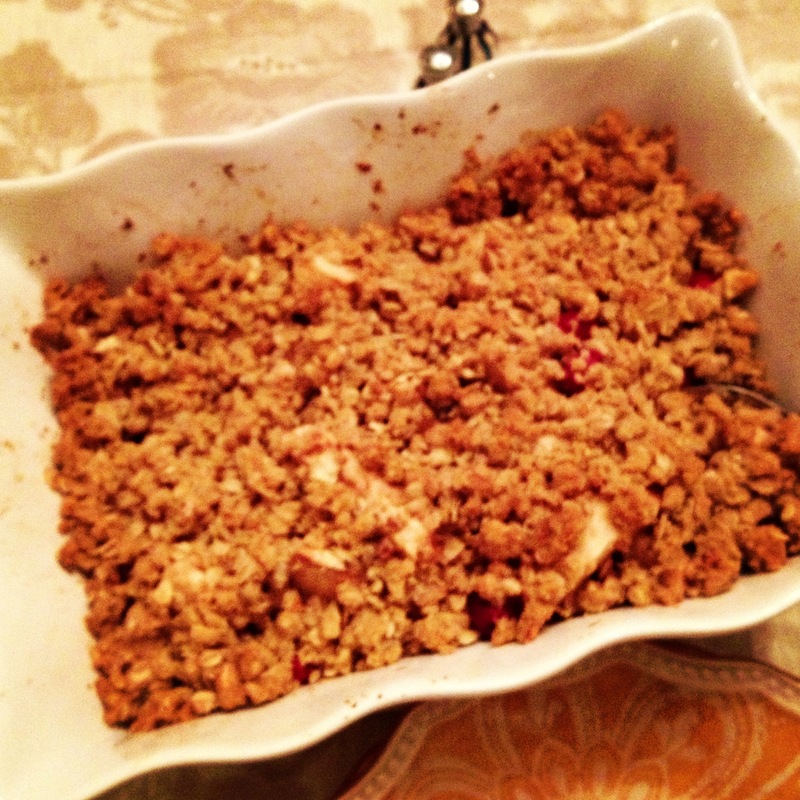 Apple Cranberry Crack… I mean… Crumble! On a roll here… 2 in 2 days! As you all know, I’m am not much of a dessert maker or (god forbid) baker. Which is ok because my favorite desserts are often seasonal fruity in nature, and leave more time and kitchen space for making the more exciting savory elements of a meal. Last night my mom made an amazing southern dinner complete with buttermilk-soaked fried chicken, mashed potatoes and greens. Yum! So of course we needed some sort of dessert to complete the festive meal. As she had a bowl of apples that were getting squishy and long past their prime, this seemed a perfect sweet-and-tart way to end the meal. A crisp is sort of the dessert version of shakshuka – a good end point for many things that you may have in your kitchen and be wondering what to do with. You can use just about any kind of nuts, oats or granola for the topping, and any sort of fruit for the filling. I like the cranberries because they add a nice tart compliment to the sweetness of the fruit, and you can keep a bag in the freezer and it will last forever and ever. Mash the topping ingredients together in a bowl until they are evenly distributed with the butter. Spread the topping evenly over the fruit mixture. Bake at 375 for 40-45 minutes (until the top is golden brown and the fruit mix is bubbly hot. We have finally settled in a bit more to Knoxville, and we’ve especially been soaking in two of the amazing things this part of the US has to offer: great hiking and an abundance of amazing summer produce. Well, I’ll add a caveat to that. This post is actually born out of a less than amazing piece of produce, amongst an otherwise incredible bounty, that I picked up at the farmer’s market the other day. I chose a small watermelon for dessert and was surprised to slice into it and find it was a yellow watermelon. It was beautiful, but unfortunately had very little taste. Still, it wasn’t mealy or anything, so I was trying to think up uses for it. 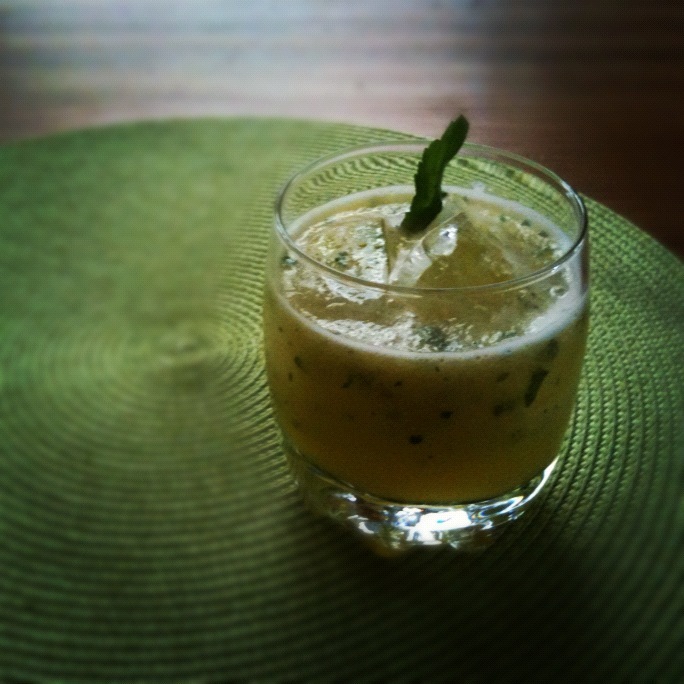 It needed a bit of sweetness added, and we had some herbs on the counter, so I immediately thought of a watermelon cooler. If it weren’t in the middle of the afternoon on a weekday, and if our liquor cabinet had been stocked up, I’m sure I would’ve added some booze. Some would say vodka, but personally, I’d go for rum. But then, I’m more of a rum drinker than a vodka drinker… Anyhow, I digress. This was a refreshing snack this afternoon. It is somewhat annoying to put the juice through a sieve, but to tell you the truth, it only took a minute or two, and we don’t have a juicer and there were lots of seeds in the watermelon, so it was necessary. Those of you with a juicer, juice away sans sieve! Place the watermelon in a blender or food processor and blend quickly, pulsing until liquefied, but not longer. Pour the juice through a sieve, pressing the fibrous bits to get any remaining juice out. Dispose of the fibrous leftovers and seeds. Strip the herb leaves off the stems. Add the extracted juice back to the blender with the sugar and the herb leaves. Blend until smooth and herbs are incorporated. Serve over ice, adding alcohol or a squeeze of lime if desired. I’m lame and we’re in the middle of packing up our house, so forgive me for the only photo I have to go with this post, which is an empty box of meringues. Oh well. Nevertheless, even without good photos, I couldn’t resist sharing this incredible recipe, which will definitely be on my dessert rotation. That is saying a lot, because as I’ve mentioned before, I’m not so much of a dessert person. We were having friends over last night, one of whom is gluten-free and so I was searching around for a recipe for something gluten-free. 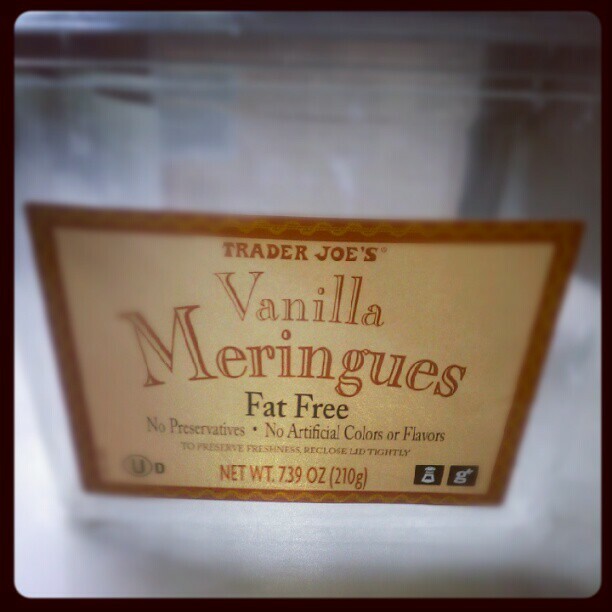 I hate baking, and I’m not a fan of heavy desserts, so for whatever reason I was thinking I could do something with store-bought meringues, which are gluten-free (at least Trader Joe’s brand is…). I came across this recipe for Crushed Raspberry Creams at BBC’s Good Food blog, which basically mixes crushed meringues in with Greek yogurt and creme fraiche and layers that with raspberries. I recognized it as kind of modified Eton Mess–a British dessert that has the same ingredients with whipped cream instead of yogurt/creme fraiche. Traditional Eton Mess uses strawberries, but the following recipe would taste great with any kind of summer berry. However, I really do think the tartness of raspberries or blackberries are best here. The recipe can be slightly less guilt-inducing when made with yogurt, depending on what kind you use and how much creme fraiche you add. I think next time I make it, I might omit the creme fraiche to see what I can do with a lighter version since heavy cream and creme fraiche/sour cream don’t sit so well with my stomach. That said, the version below was delicious and oh so easy. Blend together the yogurt and creme fraiche. If you wanted to, you could add in some lemon zest or a pinch of a spice, like cardamom–I can see all kinds of ways to experiment here. Chill this mixture in the fridge. Combine the berries in a bowl, but save 4-10 raspberries and/or blackberries for garnish. Sprinkle remaining berries with a tablespoon or so of sugar, and macerate them lightly to release some of their juices, keeping the berries more or less whole. I didn’t add any herbs, but mint or basil could be delicious added in here. Let sit at room temperature. In the meantime, chop up the meringues into pieces with a knife. I tried to do this in the food processor, but I found that the meringues were turning to powder, and so I finished the job by hand. Just before serving, pull the yogurt mixture out of the fridge, and fold the meringues into the yogurt mixture. I didn’t add any additional sugar, but you can taste the mixture and add some if you’d like. In 4 or 5 small teacups, or clear glasses (which will allow you to see the pretty layers), layer some yogurt mixture, then berries, and then end with more yogurt. Garnish each cup with a berry or two and serve. The recipe said that these can keep for four hours assembled in a fridge, but I wouldn’t add the meringues to the yogurt until last minute, so you can keep some of their crunchy texture in the mix. Enjoy! Everyone knows I’m not much of a baker. I love fruit for dessert, and a treat every once in a while, but for the most part, I’d rather have more salty than sweet. Also, baking is much more limiting in my mind than regular cooking, since you really do need to follow a recipe and pretty exact quantities to avoid your cake collapsing, or what have you. That said, here’s a relatively easy dessert recipe that I recently encountered while trying to figure out a tart dessert to make for a dinner party. I do like tart desserts and fruit desserts, but I don’t like making crusts or icing cakes, so this recipe for Lemon Pudding Cakes appealed. You will dirty several bowls making this dessert, and whip some egg whites, which can be a pain if you don’t have an electric beater, but other than that the assembly is a snap. The low-flour content makes their texture incredible: cake-like at the baked top; souffle-like in the middle; and with a delicious, creamy pudding layer at the bottom. They manage to be both lush and not too heavy all at the same time. They’re also great both warm and chilled–I had them both ways–so you could always make them ahead of time. They don’t need any accompaniment, but some fresh berries on top are both beautiful and tasty. We had it with strawberries, but raspberries would be perfect, I think. Preheat the oven to 350°. Spray six 6-ounce ramekins or teacups with vegetable oil spray. In a medium bowl, whisk the sugar with the flour. In another bowl, whisk the egg yolks with the melted butter until well blended. Whisk in the milk, lemon juice and lemon zest. Pour the lemon mixture into the sugar mixture and whisk until smooth. In a medium bowl, beat the egg whites with the salt until firm peaks form. Fold half the egg whites into the lemon mixture, combining thoroughly but gently. Gently fold the second half of the egg whites into the lemon mixture, careful to not overmix. Pour the batter into the prepared ramekins and transfer them to a small roasting pan. Place the pan in the oven and pour in enough hot water to reach halfway up the sides of the ramekins. Bake the pudding cakes for 35 minutes or until they are puffy and golden on top. Using tongs, transfer the ramekins to a rack or wooden cutting board to cool for 20 minutes. Serve the cakes in the ramekins warm, or at room temperature, with the berries. Serves 6, and can be refrigerated for up to two days. Although I am not a baker, Kileken loves banana bead and I hate throwing away old bananas, but there comes a certain juncture when they are too mushy and brown for my granola and yogurt breakfast-banana bread to the rescue. This is a recipe adapted from Cooks Illustrated. My Aunt gave me ten years of bound Cooks Illustrated and it’s fun to read since they actually describe the science of cooking. For example, take caution when mixing. If you stir to a smooth batter, the loaves turn out tough and small. Flour contains protein and when protein mixes with water, gluten develops. The more you stir/mix, the harder the loaves. My mom has first hand experience with this as she accidentally used a mixer. The other reason why I like this recipe is that it uses yogurt and I have found you can cut the amount of butter. 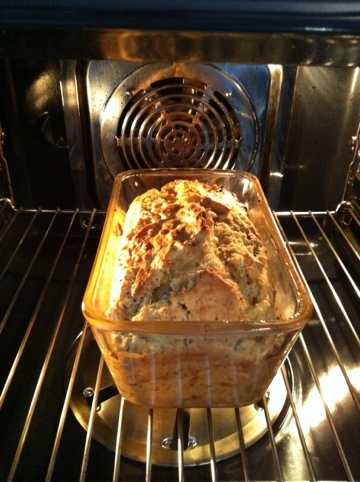 The yogurt also creates a much softer and tastier bread than conventional recipes. 5. Lightly fold wet/banana mixture into dry mixture until thick and chunky. This is when you would add any of the optional ingredients. Pears are in high season at the farmers market in France over the past few months. 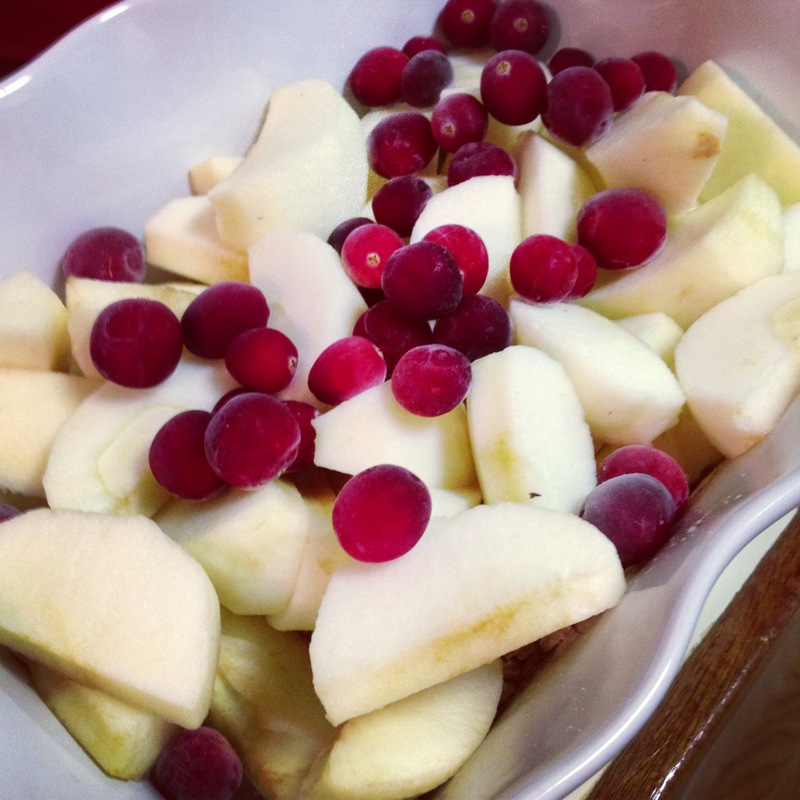 Over Thanksgiving when I was in Maine, we had dinner with friends who made a lovely dessert of Poached Pears. They are light and perfect for winter post-meal, especially with a dollop of ice cream or fresh whipped cream. By cutting the pears flat on the bottom, you can stand them up on a plate. You can make it a day or two in advance and given the simplicity of the recipe yet elegant presentation, it’s great for dinner parties. If you have extra sauce, you can also save it and pour it over yogurt. You can also use red wine and the peaches turn a beautiful rouge color, but I personally prefer white wine since I find it to be lighter and more delicate in flavor. In a large pot, put all the ingredients together and ensure that the pears are snug. Put it on moderate heat and simmer until you can put a fork into the pear (20-25 min). Do not cover. Take the pears out and put them on a plate. Strain the liquid into a pot and discard all the spices. Reheat the liquid at high heat to reduce for 10-15 minutes. The liquid should be light and syrupy. 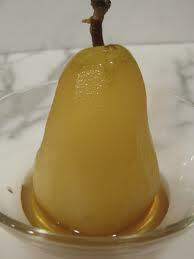 Allow the liquid to cool slightly, then pour over the pears when you serve with ice cream.